Sugar free jam by Xyloburst sweetened with 100% all natural xylitol from non-GMO U.S birch trees and fresh Blackberries, Blueberries, Raspberries, Strawberries. 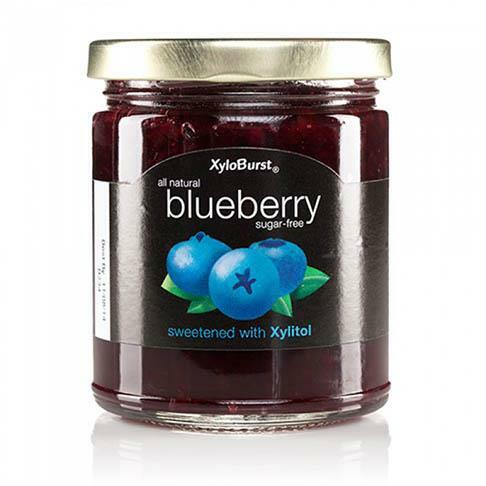 XyloBurst all-natural, sugar free Blueberry Jam sweetened with Xylitol 10oz/284g glass jar. XyloBurst Sugar-Free Jam is a great tasting blend of delicious fruit sweetened with all-natural xylitol. We use only fresh juicy ripe fruit and add just the right amount of fresh ingredients that make the best sugarless jam you will ever taste. Ingredients: Fresh Blueberries, Xylitol, Fruit Pectin, and Citric Acid. Refrigerate after opening.